My energy charge used to be N13.21 per Kwh because I live in a residential apartment. How much would I be charge in the new tariff plan? You will be charged N21.30 per Kwh if you use a single phase meter. However, if you use a triple phase meter, you will be charged N21.80 per Kwh. However, please find below tariff rate for different classes of customer. I want to change my details i.e. name, phone number etc. ; how do I go about it? Kindly go with your proof of ownership to the customer care center at your nearest business unit. What is my tariff class? Your tariff class is clearly stated on your bill. My meter is in good working condition, the marketer in charge takes the reading monthly but I keep getting estimated bills, how do I resolve this? Please contact Ikeja Electric call center or send your account details with the current meter reading to customercare@ikejaelectric.com and this will be investigated. Please contact Ikeja Electric call center or send an email to customercare@ikejaelectric.com with your account number and full address in order for this to be rectified. I made payment some months back and up till now the payment has not reflected. Why? Please take your evidence of payment to the nearest Business Unit. I made payment early this month and the bill brought yesterday does not reflect my payment why? Your payment must have been made when the current bill was already being printed and so your payment could not be captured; it should reflect on the next bill. What is fixed charge and why should I pay it? Fixed charge is a statutory rental fee. 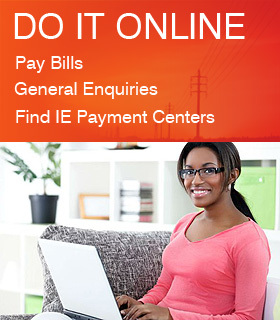 However, you will no longer pay fixed charges has approved by our regulatory body NERC.